People have long made use of the rural landscape for its sporting opportunities. The relief of the land can render running, cycling and horseracing unpredictable, stimulating and challenging. Throw a motor into the mix and the possibilities are multiplied. Be it two wheels or four, the motorised vehicle can be an exhilarating way to explore the countryside through sport. Whilst many motorbike sports focus on speed, skill and finesse is the arena of the motorbike trial rider. The bikes used are extremely lightweight and, unusually, lack a seat. The competitor rides through an obstacle course, avoiding touching the ground with their feet. Scored by an observer, the competitor is penalised whenever a foot touches the ground. Points are given as penalties and the winner is the rider with the fewest points. The course’s obstacles may be manmade or occur naturally within the formation of the land. Particularly popular in the UK and Spain, motorbike trials are perfect for the sportsperson who is looking to fuse their enjoyment of the rural environment with the cultivation of challenging skills. Scrambling, now often termed motorcross, is an off road motorcycle racing sport. Fast, furious and muddy, it offers a real adrenaline rush. The sport often takes place in wet weather and racers must skilfully manipulate their bike in order to traverse the mud and puddles. It is for this reason that the sport is often referred to as ‘scrambling’. Riders need to be tough and determined and high levels of fitness are necessary. Given the spraying mud, the speed and the noise, motorcross can be exciting to watch, let alone participate in. In addition, it is relatively easy for intrigued individuals to discover events in a given area either online or through keeping an eye on the local paper or listening to regional radio. 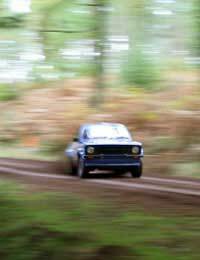 Swerving from two wheels to four, rallying takes place using cars as opposed to bikes. Rather than completing a circuit, drivers compete on a point-to-point course on either public or private roads, accompanied by a co-driver. Control points, also termed ‘stages’, break up the race at regular intervals. Rallies can be won through intense speed or by completing stages of the race at pre-planned, ideal journey times. Unpredictable and exciting, rallies often draw huge crowds. Those interested in giving rallying a shot are advised to join a local automotive club and gain vital initial experience of navigation and teamwork through taking part in club rallies. The beauty of rural motorsports is the fact that they are exciting to compete in but also to watch. Motorbike trials, scrambling and rallying all offer up a unique visual feast, with added mud and dust. For those looking to kick start their weekend, a few hours spectating, or even taking part in a motor sport could provide the perfect injection of adrenaline. Spectators should take along a waterproof, a flask of hot chocolate, tea or coffee and an open mind. The ultimate alternative country pursuit, such sports are where the extreme and the rural meet. Hello I am trying to find a motor rallying day out for the guys in my office. Can you help?